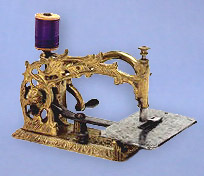 Miniature sewing machine - "Foliate". Simply known today as "Foliage", this solid brass miniature figural machine was produced by D.W.Clark of Bridgeport, Connecticut, during the late 1850's. 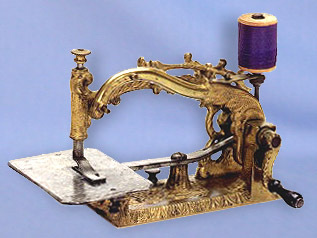 The machine produces a simple chain stitch. This model is well sought-after by today's enthusiasts.